Today I built a lightbox. After gawking at the beautiful pictures I had seen in foodblogs, it hadn't occurred to me that they were the result of more than just beautiful food and a fancy camera. During the food styling session of Eat Write Retreat, I watched Lisa Cherkasky and Renee Comet carefully dance around three huge reflectors, circling a tiny table with a masterfully styled dish in the center of it. The results were incredible. A salad that I had chopped the tomatoes for had been transformed into something that look like it belonged on the shiny pages of a magazine. I quickly realized that I was severely lacking in my knowledge of food photography. I ran back to my hotel room to Google home photography kits. 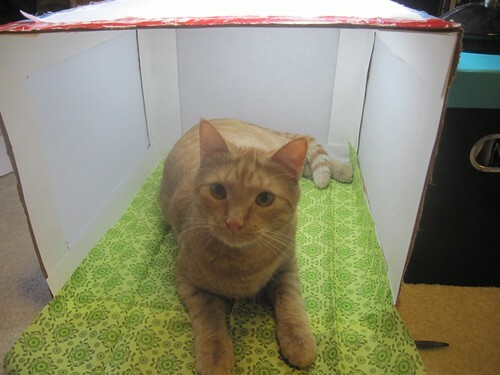 I found quite the range--everything from super professional packages costing well into the thousands of dollars to overpriced small starter kits with a tiny box plus what looked to be nothing more than a desk lamp from IKEA. My grad school income didn't allow for extravagant purchases, and even the cheaper versions seemed like a waste of money. Not to be defeated by pecuniary limitations, I immediately searched for instructions on how to build a lightbox for food photography. My search lead me here. I should probably mention that I'm not the most handy gal. Admittedly, I often use my lack of height to my advantage and bribe my taller friends to hang pictures for me with the promise of cupcakes. My sister has always been the organizer, the mathematician and the builder of the family. She's been methodical about constructing things since we were younger when she'd spend hours making elaborate LEGO scenes. She reads the instructions, measures, and thinks ahead. Me? Well, I read the instructions. I try to measure accurately, but I lack patience when it comes to things besides baking. So, you can imagine my happiness today when, after three days of effort and one giant glue fiasco, I finally finished my lightbox. Mascarpone, aka Mars, trying out the finished product. Perhaps he has a future in modeling? With that project crossed off my to-do list, I moved onto my next big idea: trying out my beautiful new Calphalon grill and panini press. I won it at EWR11 and couldn't wait to try it. After all, I don't even have a toaster or a George Foreman grill. But, I had lugged the box around DC, carefully balancing it on top of my wheeled suitcase. I was anxious to see if it had survived the many tumbles it took after hitting curbs and cobblestones. But before I could get grilling, I had one question to answer: What should I make first? Taken in my lightbox--Look, Ma! It really works! I was inspired by a beautiful eggplant I had purchased the day before at Trader Joe's. 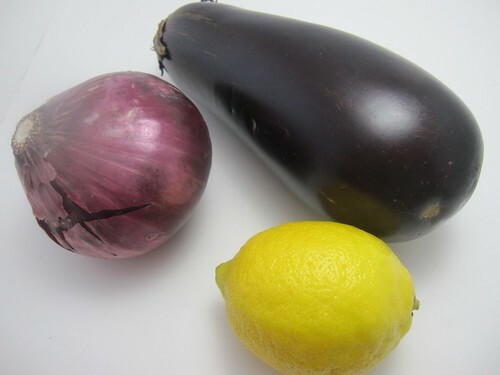 Whenever I see eggplants, I want to buy them because they have skin that looks rich and elegant and it always makes me want to make something equally luxurious with them. I somehow manage to resist their allure, however, because I never know what to make. My experience with them has been limited to eggplant parmesan, and whenever I think about how to expand my repertoire, my brain immediately goes blank. Despite my rationalizing, however, I convinced myself that I'd figure out what to do with the purple vegetable and it somehow found its way into my cart. I was also inspired by a recent purchase on Amazon. My dear friend and culinary mentor Steve recommended TheDean and DeLuca Cookbook when I was in search of an all-around good cookbook. Steve is like the King Midas of cooking because his apartment kitchen is tiny, but everything he whips up turns to edible gold. Naturally, I took his advice and ordered the book. To make the deal even better, I bought it used and it was barely $5 including shipping! When it came in the mail a few days later, I spent hours devouring the recipes in front of me, anxious to check my cabinets to see which ingredients I had so I could start make something to abate the immeasurable excitement that had commandeered my thoughts. About halfway through the book, I had an epiphany. I was reading a recipe for falafel when it dawned on me that I had all of the ingredients. I loved falafel--why had I always assumed that it was too complicated to make? At that moment, I was struck with a feeling of invincibility. I wanted to make Thai chicken coconut soup and homemade hummus. I wanted to bake brioche and braise short ribs. I wanted to be the master of my kitchen. I was going to get rid of processed foods and preservatives and fill the space with from-scratch dishes and the feeling of accomplishment. 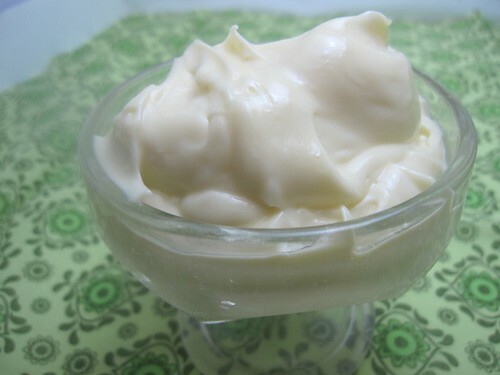 I decided to make mayonnaise. Well, backup. 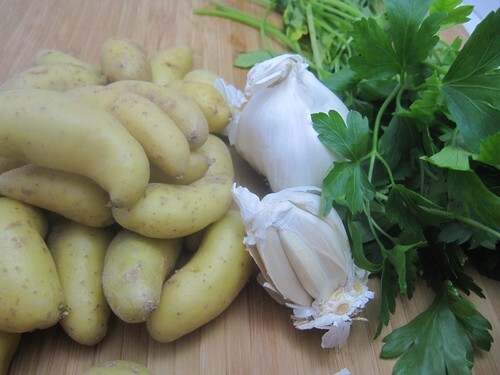 D&D had an amazing recipe for roasted potato salad with rosemary and lemon that called for mayo. I don't normally use the stuff, so I never have it on hand. Filled with culinary courage, I looked up the recipe and gave it a whirl both literally and figuratively, as it came together beautifully in the food processor. 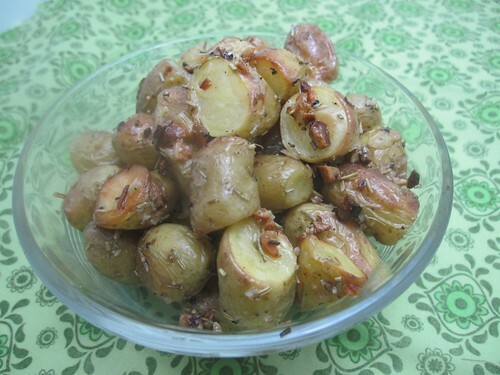 I was a bit shocked to see just how much oil goes into the recipe, but it didn't deter me from adding it to my beautifully roasted potatoes. For the main course, I brought out my friend the eggplant, amputated a few slices from him and put each piece on my pre-heated grill pan next to a bright red onion slice. The veggies sizzled when they met the hot surface and were done in a few minutes' time. When I lifted the cover, I was met with a wave of steam and the sweet smell of caramelized onions. The grill had left beautiful sienna-colored grill marks, grafting the veggies with diagonal stripes. I lifted them off and placed them on a grilled panini roll, lightly sprinkling the top with crumbles of feta cheese. I didn't even bother with salt and pepper. 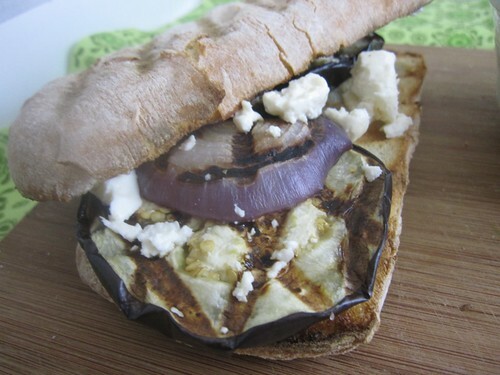 The sandwich had the crunch of bread, lemony mayo, salty feta, tangy onion and a surprising sweetness from the eggplant. It was a fantastic meal to christen my new grill.